The construction of Apollo is composed of 3 separate cabinets and no less than 3 types of materials. 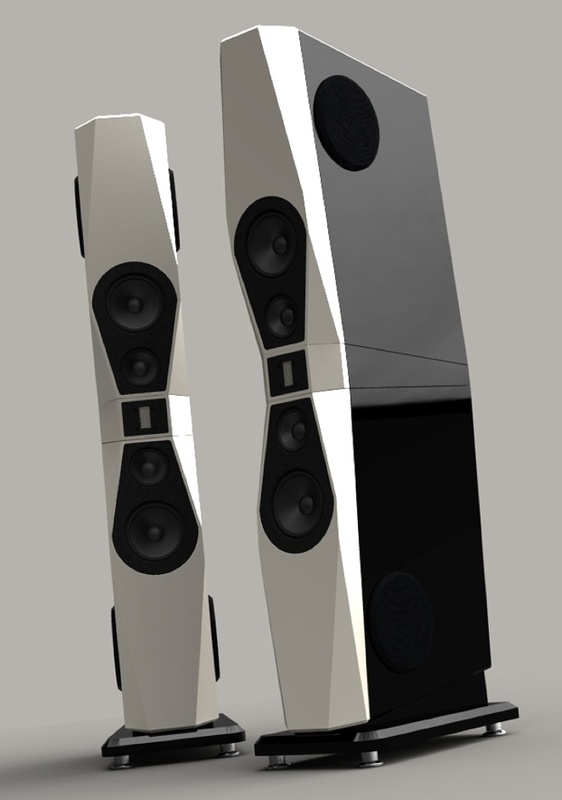 Because it is a MTM design, the cabinet is divided to two that holds the mid, woofer and sub with the center cabinet holding the tweeter. It will be a totally sealed box design with about 5L for the mid and 19L for the woofer and 43L for the sub. The volume is a bit less for the sub but with room gain and a small amount of Linkwitz Transfore, its should go down to 15Hz. 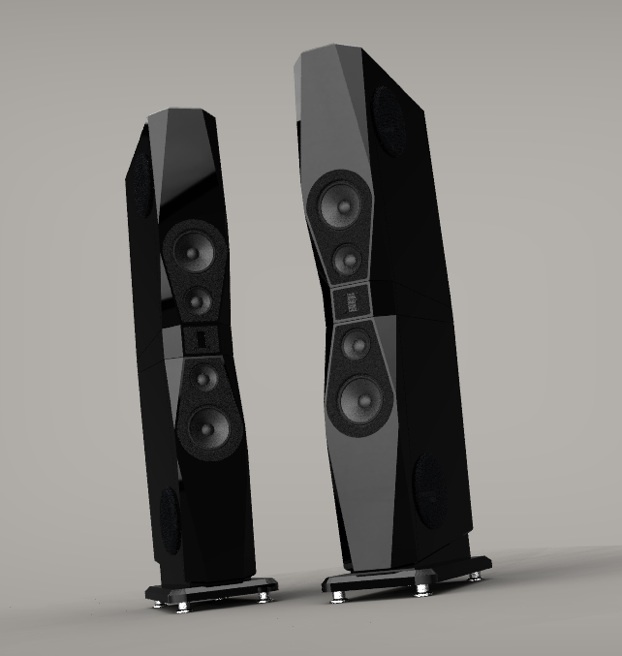 Here are 2 renders in black and White/Black. To me, it is quite clear that the White/Black version looks much better! Shin is so kind to make sure that I have the right color chosen and he sent over samples of Corian for me to choose. In the end, I have decided to use Designer White. In Hong Kong, the market of this kind of manmade stone is totally taken over by Japanese and Korean products. I cannot even get a descent sample of Corian. The internal structure of the cabinet is also heavily braced. This kind of bracing is very important especially for sealed box design, controlling the box resonance to almost non-existence. As mentioned before, the 10” woofer will also be pressed against the brace. The accuracy of cabinet construction will also compensate for the variance of manufacturing tolerance. 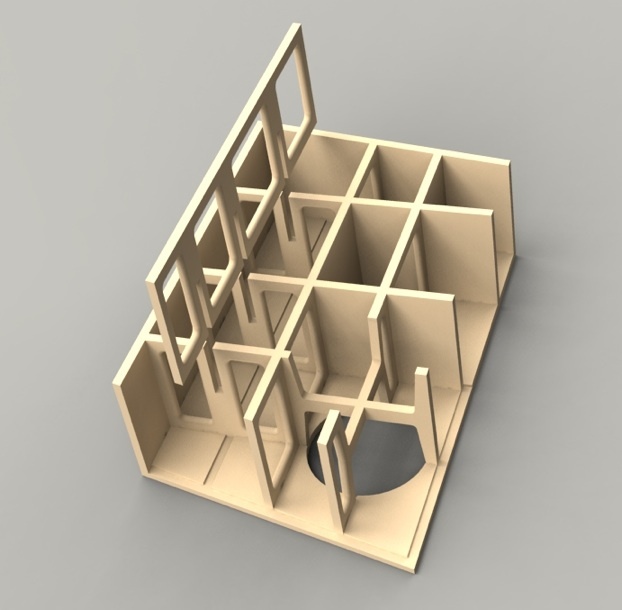 The cabinet will be cut on CNC with an accuracy of 0.0125mm between cuts. Since this is nearly 100th of mm accuracy we can call this very accurate. AT state all measurements are within +/-0.5mm. I’d expect this to be a conservative figure but lets assume that in a worse case scenario there will be up to 1mm difference between two drivers. Taking into account the 4 CNC cuts relating to the mounting of the drivers then the maximum error margin would be 1.05mm but I think more realistically you’d be looking at around half that figure given how well built AT drivers are. I don’t see this as being a problem. Shin will also be making use of digital calipers so he can verify the driver measurements and if needed ‘match’ them. Volumes are 5.2ltr for 5ltrs, 18.9ltr for 8″ and 85.2ltrs for the pair 10″. These are exact volumes calculated after subtracting the volume occupied by bracing and the drivers. All these are within a 5% error margin of our intended targets which is more than acceptable considering the deviations in T/S parameters. However, Shin does not stop here, he wants even better control of the box rigidity and for Apollo, he will employ the use of interlocking cabinet design. You can also see that all the edges of the internal brace is also chamfered. Just when I thought the design is completed, Shin sent me an email about possible new development. 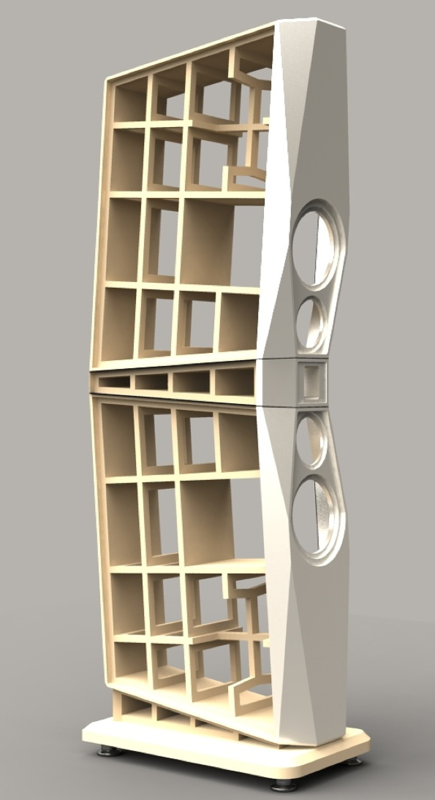 While Corian is an excellent damping material, its resonance can be further tampered by using composite construction. Using a Corian outer shell probably 24mm thick which is then filled with a pourable mineral based resin with slight elastic properties for excellent damping possibilities. However, long term stability of the resin and in particular – shrinkage where the resin shrinks over time and no longer sits tightly within the Corian shell can be a problem. If this happened then the baffles wouldn’t be performing to specification and I will never accept that option. Special resins with zero shrinkage, even over a period of many years is needed. Alternatively, a Corian outer shell again about 24mm thick which is built around an inner core of MDF. These two would be bonded together with a visco-elastic silicone based glue to achieve damping similar to the Corian/Resin mix above. To explain a bit more about how this works, I managed to find an excellent video. 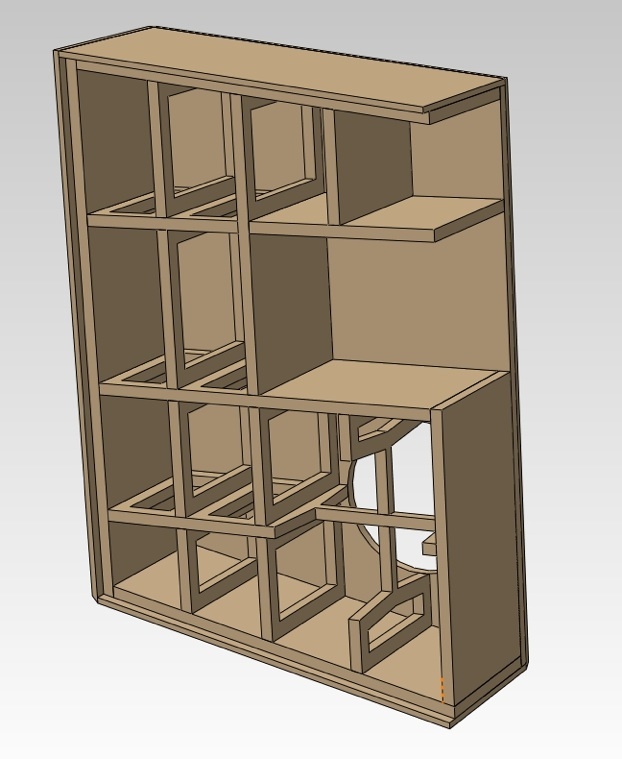 Since the cabinet will be shipped to me in 2 pieces, we need to somehow connect the 2 pieces together at my place both structurally and electronically. Shin has thought of using Neutrik SpeakON connector which is widely used commercially. However, this doesn’t fit the style of the cabinet very well. This doesn’t fit the style of the speaker very well either. Shin’s idea of the current design is one of simple, yet powerful; elegant, yet sophisticated. 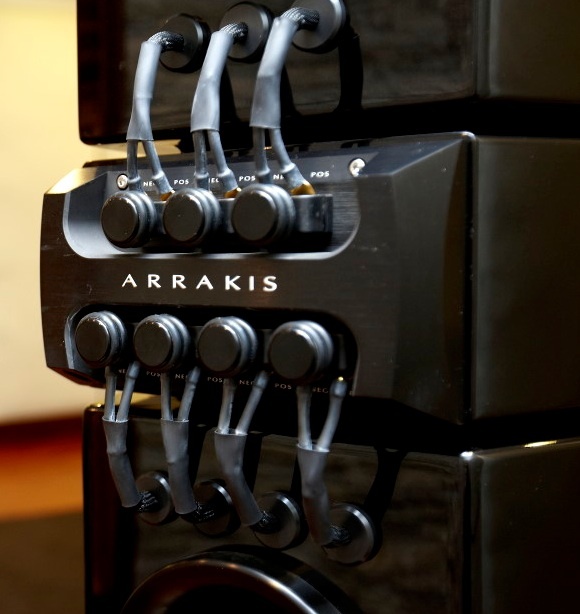 Arrakis’ approach is too bulky and will just destroy the delicacy and beautiful gloss piano black of the speaker. In the end, we decided to fit the connector between the top 2 cabinets; and IEC connector will be used instead. Worried about the IEC connector will be damaged during installation, Shin has decided to use similar interlocking system to stop the cabinet from moving and the weight of the top cabinet will also stop it from tumbling over.